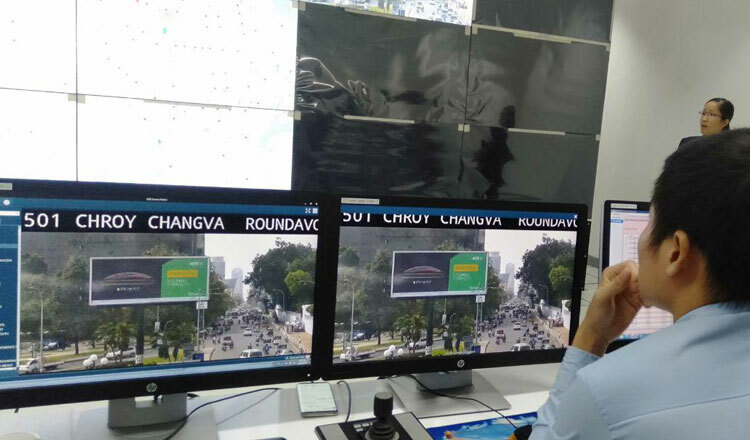 City Hall’s Traffic Control Centre director on Tuesday said that it has completed a project aimed at improving traffic conditions in Phnom Penh. The Japanese government granted $16 million for the project to be carried out by City Hall. Together with the Japan International Cooperation Agency, the TCC began the project in Phnom Penh in March 2016. According to JICA, the project aimed to improve the average travel time in the city, reduce travel time costs along Monivong Boulevard, and reduce the dispatching of traffic police at intersections and traffic accidents. During the project’s three -year duration, the TCC installed traffic lights at 115 intersections, 194 image detectors and 26 surveillance cameras in the capital. TCC director Pheng Pharinet said the project concluded in December, but was extended to February. Ms Pharinet said the TCC installed traffic lights in districts prone to heavy traffic, such as Daun Penh, Prampi Makara, Chamkar Mon and Tuol Kork. She said these areas see the most traffic during peak hours from 6am to 8am and from 4pm to 6pm. She said that TCC will manage and monitor 109 locations directly from its command centre. With a population of more than two million and a land area of 678 square kilometres, traffic conditions in the capital have worsened over the last year due to a rapid 379 percent increase of vehicles. Ms Pharient said that people must respect traffic laws in order to ensure good flow of vehicles in the capital. She noted that despite modern technology being implemented, people contribute to traffic problems by not obeying laws.